Yesterday, in How to Lose 10 Pounds this Month, Part 1, we talked about the frustrations of trying to lose weight and how difficult it is for wives and moms to fit weight loss into their busy schedules. I also outlined a healthy eating plan that’s designed to help you lose about 10 pounds over the course of four weeks. 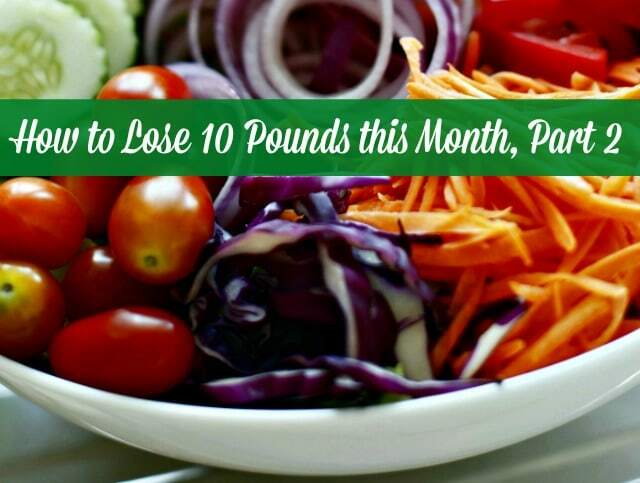 If you haven’t read that article, How to Lose 10 Pounds this Month, Part 1, I encourage you to read it first. Today, in Part 2, we’re talking about how to get off to a great start and do things that will make it easier to stick with your weight loss plan. Before you begin, I encourage you to do a few simple things to set yourself up for success. Taking these steps will help you get ready to start the program and make it easier to stick with the healthy eating plan and lose 10 pounds. 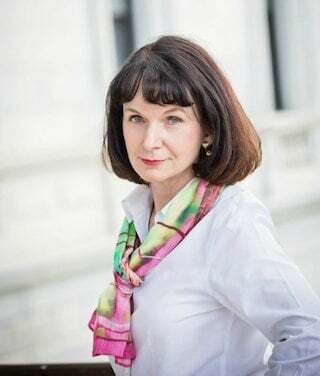 It’s like cleaning out your car before a trip or organizing your desk at the beginning of the day – it gives you a positive outlook and make it easier for you to succeed! • Clean out your refrigerator, freezer and pantry/cupboards. This doesn’t have to be a deep cleaning, and it shouldn’t take a lot of time. 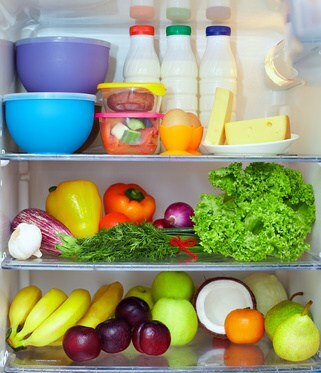 Just take a few minutes and organize each area where you store food. Then, put the healthy foods you already have on hand “front and center” so that you can see them and access them easily. The idea behind this step is to create plenty of space to store the foods you want to eat, to make it easy to access them, and to make other foods less accessible. • Make a menu and grocery list for Week 1. As we talked about in Part 1, this diet emphasizes vegetables, protein and healthy fats, with small amounts of other foods added in gradually. And the problem with this kind of eating plan is that you can’t “wing it” very easily – you need to know ahead of time what you’re going to eat and you need to have it on hand. Because most of the foods you would grab for a quick meal on the spur of the moment just don’t fit the plan. So make a Week 1 menu plan that includes every meal – breakfast, lunch and dinner. Use the example foods list in Part 1 (or this printable list) to come up with meals that fit the plan. Then make a grocery list that covers your meal plan, plus meals and snacks for your family, and shop for groceries for the week. • Prep some of the food you’ll be eating this week. Let’s be honest – preparing and cooking foods that help you lose weight takes time – more time than cooking convenience foods or eating restaurant food. 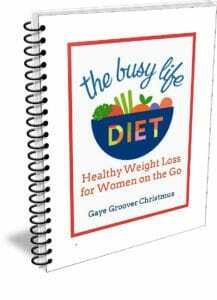 And finding that time can be a huge stumbling block for busy women who want to lose weight. We have to face that reality head on, by making some time up front (usually on Saturday or Sunday) to prep food for the week. So take an hour or two and do several of the following (or similar) tasks: wash vegetables, cut up vegetables for salad or stir fry, grill chicken breasts, roast some vegetables, boil eggs, cook chicken or beef in the Crockpot, make homemade olive oil-based salad dressing, make some lunches, and package vegetables for snacks in small bags or containers. Record your starting weight on the day you begin the diet. You can write it in your planner or on your calendar or use an app on your phone to record it. Although you want to keep track of your progress as you work through the diet, consider whether you want to weigh yourself every day. Some women like to get into that habit, but others get frustrated by the day-to-day fluctuations in weight that can occur. Decide what works best for you, but weigh at least once a week over the four weeks. You may feel bad for several days. As I mentioned in Part 1, when I started eating this way I felt bad for about 4 days – tired, headachy and cranky. I had been eating a lot of carbohydrates, and the transition to a lower-carbohydrate diet wasn’t much fun. After 4 days, though, I felt great. If you feel very bad during the first few days you can add a small amount of complex carbs. However, you’ll probably see the best results if you’re able to stick primarily with vegetables, protein and healthy fats during Week 1. You should lose weight. Every woman is different, but my hope is that everyone who sticks with the eating plan will lose several pounds in Week 1. You may feel less hungry or experience fewer cravings. Again, everyone is different, but many people find that cutting way back on sugar and simple carbs, increasing protein, and eating moderate amounts of healthy fats helps them feel full. If you do feel hungry, figure out what you need to increase to feel full – more protein or vegetables, a little more olive oil, more water? You may feel like you can’t stick with the plan. If you do, remember that Week 1 is the toughest week. 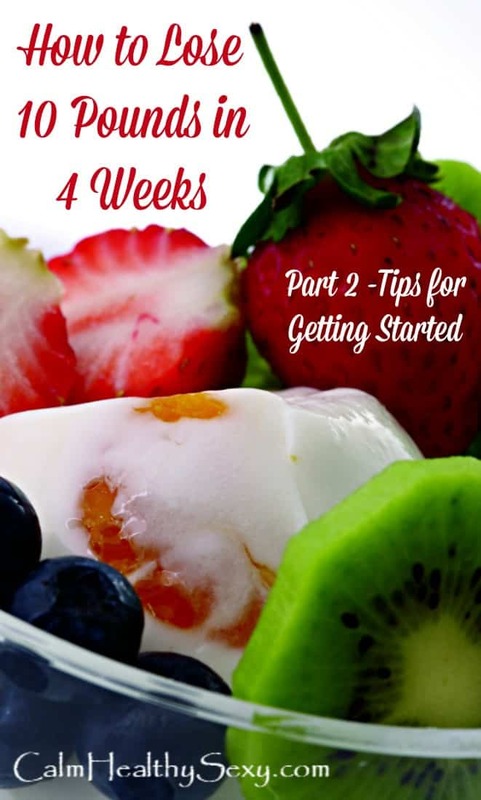 Beginning in Week 2 you’ll add small amounts of complex carbs and fruit, and you’ll start taking a “break” from the eating plan for one or two meals per week. Speaking of water, be sure to drink lots of water every day. When I’m working on losing weight I try to stick with the “eight 8-ounce glasses” guideline, which is two quarts of water a day. Some people drink even more when they’re trying to lose weight, but I’m pretty happy with myself if I manage to drink eight glasses! So to recap Week 1 – Eat lots of vegetables, some lean protein, and some kind of healthy fat at every meal (for example, olive oil in a salad dressing or for sautéing vegetables, or avocado in a salad). Don’t eat anything with added sugar. Don’t eat any processed food or junk food. Drink lots of water. If you feel really bad, add a small amount of complex carbs (brown rice, oatmeal, legumes, etc.). And don’t be discouraged. Starting a new way of eating takes time, and each woman has to do it in a way that works for her. This eating plan is a template, but over time you’ll figure out how to adapt it to make it work best for you. After Week 1, the weight loss plan includes two changes that make it a bit easier to follow. First, you add more complex carbohydrates to your diet (up to two serving per day) and a small amount of fruit (optional, see the eating plan in Part 1). Second, you add one “off plan” meal per week. Some diets call this a “cheat meal,” but it’s not “cheating,”- it’s making sure that you don’t feel deprived and can maintain the diet until you reach your goal weight. The “off plan” meal is a time for you to enjoy some foods that aren’t on the eating plan, so that you don’t feel deprived of your favorite foods. Try not to go crazy for that meal, but feel free to enjoy some of the foods you like that aren’t part of the plan. 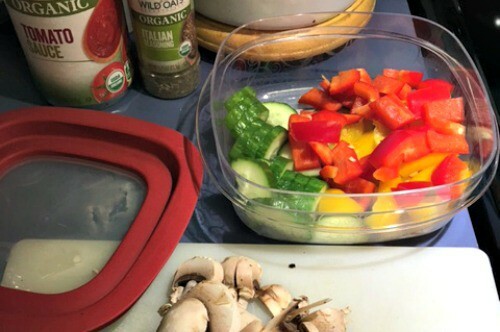 I’ve found that these “off-plan” meals are critical for me – they make me feel like I can take a short break and help me stay on the plan when I know I have that break coming. 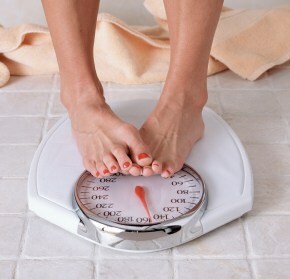 How to Lose 10 Pounds – Need More Help? If you’ve been wanting to lose some weight, now is the perfect time to do it. I encourage you to try this weight loss plan for 4 weeks. Losing weight is challenging, but with a healthy eating plan, plus some prep, planning and determination, I’m confident you can do it. Want more weight loss information and support? This 4-week eating plan is based on my ebook, The Busy Life Diet – Healthy Weight Loss for Women on the Go. The ebook includes a 6-step approach to losing weight, including how to establish a mindset for success, what to eat, how to exercise, and how to make the plan work in the midst of your busy schedule. It also includes a Quick-Start Guide, printable lists and charts, and optional membership in an online Facebook support group. I’d love for you to check it out, or comment below or send me an email if you have questions about it (gc @ calmhealthysexy.com).